Ricardo Villalobos brings Frequence Resonance Remote Control back to Farringdon. Regulars at the German-Chilean’s appearances with us will know what to expect: the pioneering minimalist prepares to take control of the Room One booth through until Sunday morning, this time inviting some of his closest peers and influences to join him. Villalobos brings his own psychedelic minimal sound to our Martin Audio rig, with Craig Richards also making a return. Known for his heady collection of high-wired techno, spacey electro and groovy house bombs, by now Richards’ impact on the UK’s electronic music scene should go without saying. 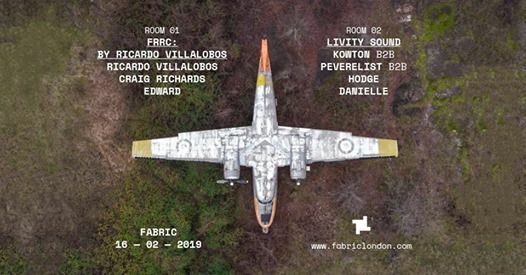 He’s also been closely linked with Villalobos throughout his career, with both artists widely known for pushing Room One to its boundaries during their regular Sunday morning sessions. Villalobos also invites Edward, whose oddball house records can be found on labels like White, Giegling, Trelik and Pal SL. In Room Two, we welcome the flagbearers for Bristol’s thriving electronic music scene as Livity Sound land. Home to a style of futurist bass music from some of this generation’s leading producers, Peverelist’s acclaimed imprint is widely credited as one of the Bristolian sound’s most forward-thinking labels. For their Room Two showcase with us, we prepare to host an extended back-to-back from three of the imprint’s key figures: Kowton, Peverelist and Hodge. Phonica Records and NTS Radio stalwart Danielle makes her debut to round off the bill.